This is the first time after I've a job that I stayed at home on Saturday night. I just want to feel my new room by doing something that I love. I have an old vintage dress that look 2 times bigger than my size, so I turned that to be a cropped top. Voila! This is the result,hehe. After my graduation, I asked a sewing machine as a present and learning how to sew by a local course but since i have to go to work two times in a month, it's quite hard to continue my course so i try to learn it by book, browse it or just see some tutorial from youtube. This week has been a great one! I just finished all my monthly job! yay! this is the fastes result that i could get to beat my crazy deadline, thanks God. There also so many great things that happen to me for this week, like meet a random cool people, jogging and doing some excercise, knitting and many more. Oh, I do knitting almost everywhere! will post some stuffs that i made for this week soon! How about your week? I hope it was great as mine. Just happy to close this day by making something that i could wear for hang with friends. 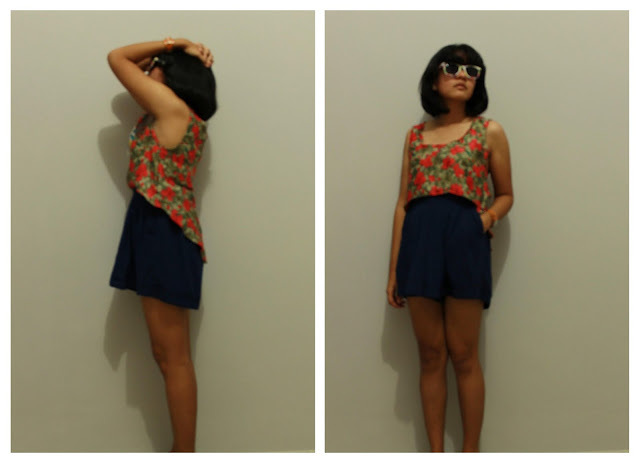 I really like the cut after you cropped this floral top!